Armafloor Floor Coating is the ultimate solution for residential garages, outdoor areas, pathways, and commercial show rooms, retail stores, malls, courtyards, restrooms, theme parks, and more. These floors are simple to maintain, strong and tough. They also look attractive. Armafloor flooring is long lasting. Its topcoat makes a corrosion protection coating system that is non-yellowing and has excellent overall weathering. Armafloor coating technology provides quicker dry time, is hard-wearing and decorative for residential, business and industrial flooring. The fast-drying feature of Armafloor means less down time for businesses, and the high film build decreases the number of coats in the coating system. Armafloor flooring is the perfect solution for your residential garage. 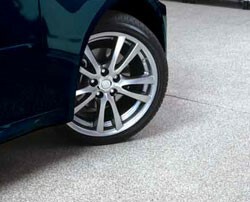 A well-designed garage floor coating with a long lasting finish that not only looks good but is seamless and durable. Armafloor gives good protection from chemical, petrol and oil stains, perfect for the tough environment of most household garage floors. With the addition of Rhino ArmaFloor’s decorative quartz chips your floor can be slip resistant, offering you added protection against slips and falls. Armafloor has a high chemical resistance and does not cause hot tyre peel. 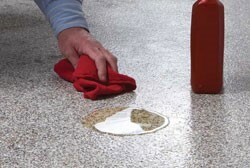 The finished product also has no real long-term maintenance, allowing garage spills to be simply wiped up. And lasts much longer than any conventional floor paints. We can convert your unattractive garage into a beautiful space for that extra entertainment room, gym, workshop, this space is limited only by your imagination.